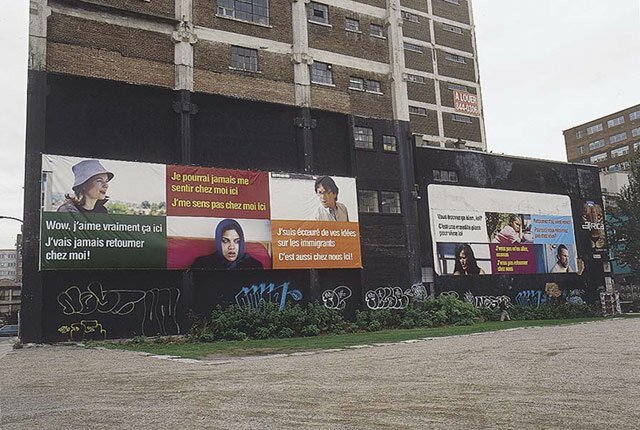 Giant banner featuring portraits of people from various backgrounds along with their personal thoughts. J'vais jamais retourner chez moi! Country of origin, emotions related to immigration and differences between nationalities. Awareness that home (the place that welcomes you) can be anywhere, regardless of nationality or religion. This project was originally produced by the Museum in Progress for the facade of the Kunsthalle in Vienna, in association with the Canadian Embassy and the League for Human Rights. The text was in English. This Canadian artist presents There is no place like home, designed for the facade of the Kunsthalle in Vienna. This work involves various protagonists, colours and opinions. The aim of the project is to give the public the means to consider the image differently depending on whether it is displayed in a public or private space. More specifically, he is interested in examining the way immigrants reconstruct their identity in their host country.